Moose are generally not aggressive, but they are wild animals - even though they may be in the city limits - and can be dangerous. Weighing in at almost 1,000 pounds, the average Anchorage moose weighs about 15 times more than the average third grade student. What’s a student to do? 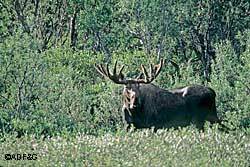 The answer is simple; learn as much as possible about moose and moose safety. A new video is aimed at just that: teaching third through fifth grade students all about moose. With 700 to 1,000 moose making the Anchorage Bowl their winter home, it is important for students to know moose safety. That’s a tough job though, considering that Anchorage has 64 elementary schools and only two biologists. “For over 10 years I’ve wanted to do a moose safety video, and we could never find the money to do it professionally,” said Rick Sinnott, Alaska Department of Fish and Game Anchorage area biologist. Creating a professional video would have cost the Department about $15,000. Wildlife Education Coordinator Robin Dublin sought a more affordable and more educational approach. “I asked my friend Emily Blahous, a teacher at Mirror Lake Middle School, if her technology students were up to the task of producing a twelve-minute video for us,” Dublin said. Blahous’ classroom is equipped with video, audio and editing equipment and a small studio for producing and broadcasting a daily news show throughout the school. Her students were definitely interested and up to the task. “I just thought it was really important that the smaller children learn how to be safe around moose, so that something didn't happen that could have been prevented by something I could have done,” said Sheridan Slater, a student working on and acting in the video. Alaska Pacific University senior Ben Mohr, along with ADF&G Wildlife Education Specialist Lilly Goodman worked together with Sinnott, Dublin and the Mirror Lake students on script development. The approach, a movie made for students by students, has paid off in several ways. During production, students from APU, Mirror Lake Middle School and Chugiak Elementary School learned about moose and moose safety in-depth as part of the project. And now Anchorage School District students are learning by the thousands as a result. A new video teaches third through fifth grade students all about moose and being safe around urban moose. Evaluations from school librarians and teachers indicate the key safety points are getting across. “Over 4,000 students have watched the video in school,” said Dublin. “We gave teachers and librarians a pre and post test to measure new knowledge gained and the students are doing great in the post test! Comments from teachers emphasize the benefit of using students in production and the clarity of the safety messages. Sandi Berlin, a teacher at Willow Crest Elementary School, said there are often moose around the school or in the park next door. 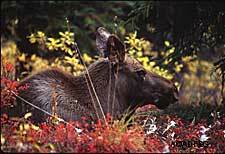 The DVD/VHS was distributed along with a teacher’s packet to all 64 elementary school librarians in the Anchorage School District and to several other communities in Alaska where moose are prevalent. Additional copies were sent to public libraries and other outdoor education programs. This month Robin Dublin ends her tenure as the Wildlife Education Coordinator for the Alaska Department of Fish and Game. She will be missed.